The Notch has been a huge topic since the introduction of the iPhone X last year. Meanwhile almost all manufacturers worldwide use a notch in the display to place sensors there and to allow more display space. But at the same time the Notch is getting smaller and smaller. Samsung, for example, has announced new Infinity-O displays with a hole instead of Notch. The competitor Elephone is also not tired of the innovations and has presented a display with a small hole notch in the new A7. You can find all information here. Elephone has officially introduced the A7 smartphone. The front camera sits behind a hole in the display and triggers with 20.0MP. The rear camera in the top version of the phone has 48 megapixels. Artificial intelligence should help to take better photos. The Elephone A7 is powered by the Helio P35 processor from MediaTek, which has Octa-core. Like its predecessor Helio P30, there are 8 Cortex A35 CPUs with up to 2.3 GHz. This is supported by 6 GB RAM, the internal memory is 128 GB. The graphics acceleration is said to have been improved compared to its predecessor in order to be even better suited for games. The operating system is Android 9 Pie. Elephone has installed a 6.41 inch IPS LCD with a Full HD+ resolution of 2240 x 1080 pixels in the A7. There is a hole in the display behind which the front camera sits. So there is no notch on the A7. The front camera has 20 megapixels with a maximum aperture of f/2.0. This is a fixed focal length not further specified by Elephone. Elephone clearly focuses on the selfie function of the smartphone. Artificial intelligence should recognize faces and display them particularly naturally. On the back there is a dual camera. There is a variant of the phone with a 48 megapixel main camera with f/1.8. A cheaper variant of the smartphone uses a main camera with 20 megapixels f/1.8 instead. The second and third cameras each have 12 megapixels. The second camera is a super wide-angle focal length, the third provides the depth of field. With the rear cameras 4K video can be recorded, with the front camera a maximum of 1080P is possible. All cameras are equipped with electronic image stabilization. The A7 measures 157 x 75.1 x 7.77 mm and weighs 172 grams. Elephone uses a battery with 3400 mAh. The smartphone also has a fingerprint sensor and supports dual SIM. It can establish connections via LTE, WLAN and Bluetooth, but according to the datasheet it cannot support NFC. Elephone has only introduced the A7 in China for the time being. The variant with 48 megapixels will cost the equivalent of around $299.99. 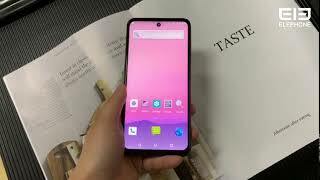 The Elephone A7 was introduced a few days ago in China as the first smartphone with a “perforated” display and is likely to find its way to Worldwide sooner or later – reason enough for us to take a closer look at the premium mid-range smartphone equipped with a 48 megapixel camera at 2019 Global Sources exhibition coming up in HongKong.